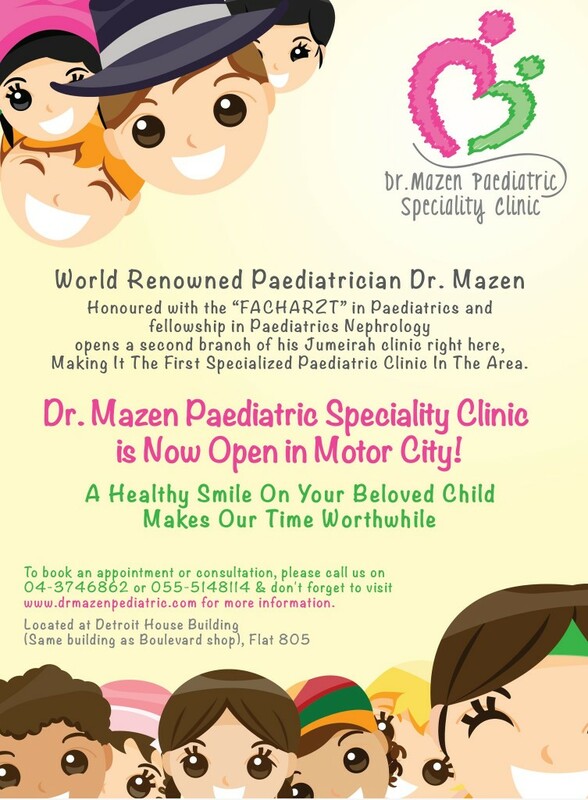 Dr Mazen Paediatric Speciality Clinic has recently opened its doors in Motor City. It is the first Specialized Pediatric Clinic in the Motor City area. The clinic offers the following general paediatric services: General Paediatric Care, New Born & Infant Care, General Peadiatric Disorders Care (such as Bronchial Asthma, Allergic Disorders, Diabetes Mellitus, Short Stature, Speech Disorder, Psychological Disorders, and Obesity & Nutritinal Disorders), and vaccinations. Clinic also offers the following Peadiatric Nephrology services: Kidney & Bladder Disorder, Urinary Tract Infection (U.T.I. ), General Peadiatric Disorders Care, Bedwetting (Nocturnal Enuresis), Blood Pressure Disorders, Kidney Function Disturbance, Dialysis (Peritoneal & Haemodialysis), Post Kidney Transplantation Care and Diagnostic.